Whatever you do, don't make the mistake of typing "Ginger Lee" into Google during work hours. Or, worse, school hours. Because you may stumble across a clip from "Stuffin Young Muffins 5", which... how do I put this... is not a cooking video. But don't worry. 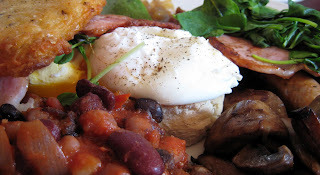 There are no muffins on the breakfast menu at Gingerlee, 117 Lygon Street, Brunswick East, Tel +61 3 9380 4430. You can, however, "check display for daily tarts". 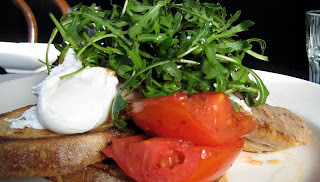 I'm not really a tart man, so I went with poached eggs, shaved ham, roasted tomato, spicy pork and fennel sausage, shallot jam and rocket (lots of rocket). The eggs were very good, and, even better, served on toasted Dench sourdough. But the pork sausage was the star of the show. Worth the $16.50 price tag. By all accounts, the rest of the menu is equally good. Ange has already raved about the Syrian style French toast with orange blossom syrup, honey labne, stewed rhubarb and pistachios (mmmm... pistachios). The Veggies have raved about the poached eggs with "slow braised" mushrooms, avocado, lemon and persian feta. And I quite liked the sound of the gluten free toasted macadamia muesli with kiwi, banana and honey cinnamon yoghurt. Gingerlee is also a very stylish venue, with concrete floors, high ceilings, black tables and nice brown bentwood chairs. The syndicate organic free trade coffee was very good, too. Originally I gave this place the benefit of the doubt and scored it 18/20. But in light of all the comments I'm downgrading to 16/20. Only a club for barristers and judges could come up with a rule that anyone caught answering their mobile phone in the restaurant must buy each adjoining table a bottle of wine. Unfortunately for me, nobody breached this rule during my breakfast at The Essoign, Level 1, 205 William Street, Melbourne, Tel +61 3 9225 6748. I would have quite enjoyed a nice Bourgogne for breakfast. Beats getting hit on the head with a bottle of Pinot Grigio. It being a week day, I opted for the "McBarrister", one of the lighter and more amusing items on the menu. 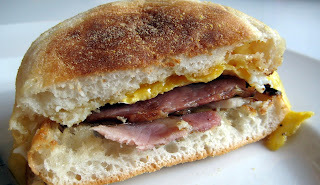 A parody of the Bacon & Egg McMuffin, only superior in every way. Fresh fluffy muffins. Tasty bacon. Fried egg. And a melting slice of tasty cheese. Simple but good. My barrister host talked up the "Trial Breakfast", but this wasn't mere puffery. 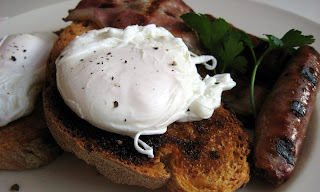 The eggs were poached just right, and the bacon, bangers and toast looked well above average. Very good coffee, too. The main problem with The Essoign is that you can't just rock up and order some eggs. There are rules, you see. You must be a member, or you must be with a member (and to be a member you must be a member of the Bar). But if you have the misfortune to be a "current litigant" (ie, someone dragging or being dragged by another through court) then you can't go at all. I can say with absolute certainty that I have no recollection of any hot, naked lap-dancers when I had breakfast at Black Ruby, 344 Rathdowne St, Carlton North, Tel +61 3 9348 2777. But I was pissed. So pissed, in fact, that I can't recall what happened. Except, of course, that nothing inappropriate happened. That I can recall. Actually, I'm lying. I wasn't pissed. And, unfortunately, I do recall what happened. It was a breakfast with all the consistency of Rudd's recollections of a Soiree at Scores. Nice beans and bangers. Nasty eggs. Tasty Bacon. Bland hash browns. Sensational relish. Soggy toast. But it was the eggs that did the most damage. If poached eggs are as deformed and damaged as what they served us, then you scrape the pieces into the bin and start again. You don't scrape them onto a plate and serve them up (the picture doesn't do them justice, but you can see a disembodied yolk if you look closely). I think the ricotta and blueberry hotcakes would have been a better option. Or maybe the honey toasted muesli with apricot, peach compote and natural yoghurt. Service, coffee and venue were all good, without being great. A bit like Kevin's lap-dance, really. Quite forgettable. At least that's what Grant Kells reckons. So nasty that he had to get one custom made by the local butcher. Whatever it takes to win the race for Sydney's best breakfast. Because in case you hadn't heard, breakfast is the new black. To find out who else is in the race, and how the Sydney Morning Herald rates them, check out Keith Austin's story for Good Living. I think Small Block deserves an upgrade to at least 16/20, with full marks (3/3) for the "other" stuff, ie, things other than eggs. 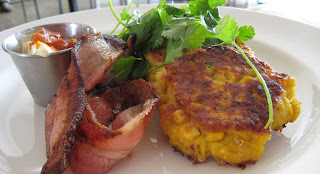 These were some fine corn fritters, with a tasty side of creme fraiche and some kind of chili relish. Good bacon, too. The Small Block menu also deserves special mention for variety. Oodles of choice, and plenty of creative twists. Even personal trainers have PR consultants in Sydney, as I discovered during breakfast at Lumiere, Shop 13, 425 Bourke Street, Surry Hills, Tel +61 2 9331 6184. Such are the joys of breakfasting alone. You get to hear some of the funniest things. I was planning to have breakfast at a place called Sage, to which the SMH gave a glowing review, and which has a very snazzy website. Problem was, the joint is closed. Gone. So I went to Lumiere instead. Not that I'm complaining. 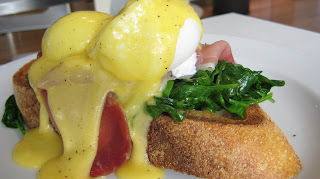 My poached eggs with spinach, prosciutto and hollandaise was very good. I still prefer ham or bacon with my eggs, but at least they used good quality prosciutto. And the hollandaise was excellent. Nice menu, too. Four fancy omelettes: roasted tomato and caramelised onion; ocean trout, creme fraiche and dill; haloumi and wilted spinach; or mushrooms, chorizo, chives and parmesan. House made toasted muesli with nuts, seeds, baked rhubarb and yoghurt. Eggs benny with smoked trout. And ricotta hotcakes with sour cherries, honeycomb and marscapone (an interesting twist on the Bills version).